We are now a certified Panasonic KX-TDA dealer. 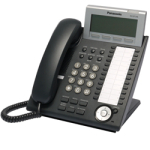 Business Telephone Systems and Voice Mail: Does your company need to say “goodbye” to some old, ailing telephones and replace them with a next-generation communications system, one that can integrate with your computer network and even your mobile phones? Do you have multiple locations, small branch offices, or a mobile workforce that need to keep in touch seamlessly? Let Excelephone show you how utilizing unified communication technologies can save your company money and help you communicate more effectively with your clients and the people you work with. Click here for more information. Network Cameras and Surveillance Solutions: Wired or wireless network cameras allow you to keep an eye on your office, home, or rental property from anywhere with an internet connection, even from your web-enabled smartphone! Recording and storage solutions allow you to archive footage, record it onto DVD, and allow multiple viewers anytime, anywhere. Click here for more information. Premise Cabling for Voice and Data Networks: Whether you are opening a new location, remodeling, or expanding an existing space, Excelephone can help you to install premise cabling for your network today that will carry tomorrow’s traffic. Our experienced technicians can also advise you on removing the old cabling “above the grid” that could pose an environmental or structural hazard. Call us today and we will assess your needs with a no-cost initial consultation. To find out how you can improve your company’s communications and your bottom line, contact Excelephone today!